In World Rally Championship, everyone knows Ford as one of the best, their Fiesta RS WRC racer is the champion. 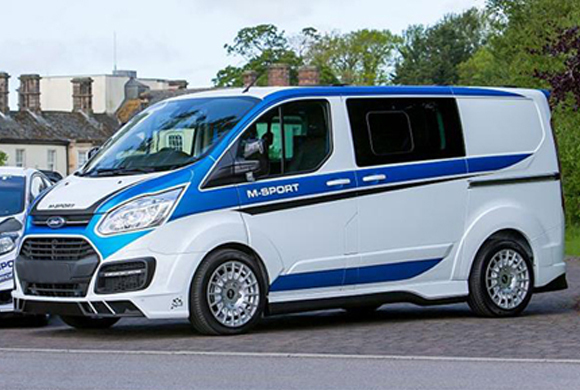 The company responsible for all this success is M-Sport, and now, they have come up with a brilliant idea of treating the king “Ford Transit Van” with M-Sport treatment. As the ‘king’ deserves something special, thus M-Sport has collaborated with another UK firm, Van Sport, to pay an exclusive tribute to Transit on its 50th anniversary. The Transit M-Sport has been rigged with 18-inch OZ Racing wheels, 18-inch Michelin Tyres, lowered Eibach suspension, and a beautifully designed quad tipped exhaust system. The standard engine fitted into the Transit Custom is a 2.2-litre turbo-diesel but for this special edition, the power and torque are still unknown. The front-wheel-drive Transit Custom’s European variant produces 151 bhp and 385Nm of torque, so it is believed that Transit Custom M-Sport will do better than that. Other enhancements are the wheel arch and rear bumper extensions, a unique set of side sills, rear spoiler, and new lower front bumper with blue-tinted LED driving lights, giving it a complete M-Sport guise. The rally car looks have been complemented with livery inspired by the Fiesta RS WRC. On the inside, Ford Custom M-Sport has been worked on elegantly, like the leather seats have the M-Sport embossed on them, instrument dials are pretty unique in their own sense, and a lot of blue trim and highlights. If you are wondering how much one of these will cost you or what number they’ll be made, there are still no words from any of the company, the M-Sport or the Van Sport. © fordtransitengines.co.uk 2019. All Rights Reserved.